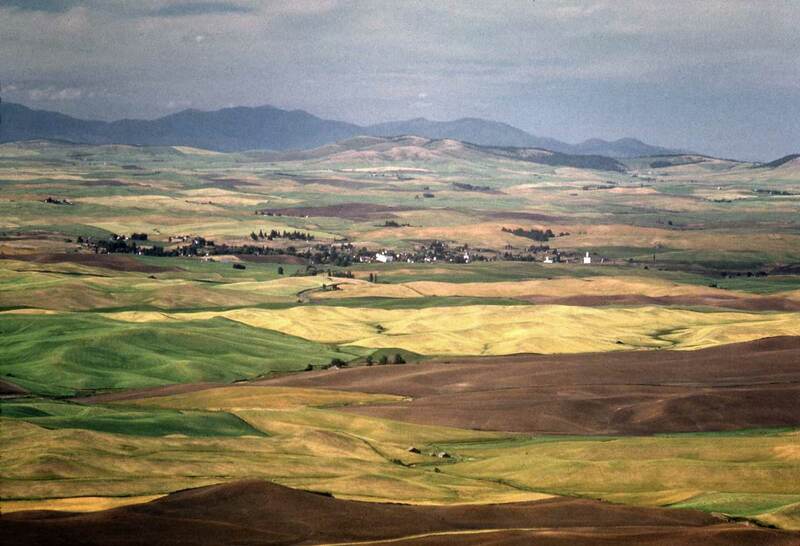 As the attentive visitor must by now know Horace Sykes liked to take the looping road to the top of Steptoe Butte. He left many Kodachromes of the patchwork fields below, and we know he often returned, for the light and sky varies so between his visits. This butte is a quartzite survivor. It is more than 400 million years old, while the basalt flows in the Columbia River Basin are in the “neighborhood” of a dozen million years old. Here Horace used a telescopic lens to look north (and a wee bit east) to the Selkirk Mountains: the dark horizon. Growing up in Spokane we thought of the Selkirks as foothills to the Rockies. Mica Peak, the highest point showing here at only 5243 feet, is but a few miles east from Spokane, but 40 miles from Horace and his prospect, the 3612 ft top of Steptoe Butte. One summer during graduate school I worked on a grass farm about 7 miles to the other side (north) of Mica Peak. My home, a tine shack in the middle of the grass field I irrigated throughout the day, was close to Post Falls, Idaho, the small town we passed on our way from sober and demure Spokane to the many pleasures of Lake Coeur D’Alene and its namesake Idaho town. Much closer to Horace than the footills are the rooftops of Oaksdale’s grain silo. They are about 7 miles from the top of the butte.